More Cotswolds Memoirs finds the author on another fun-filled roller-coaster ride as she discovers Downton Abbey’s film locations in the Cotswolds, explores their history and meets the cast during her bid to turn her newly-purchased home into the perfect cottage. Diz White’s love note to the Cotswolds can be read independently, however the story began in her last book, Cotswolds Memoir: Discovering a Beautiful Region of Britain on a Quest to Buy a 17th Century Cottage, when this British-born author’s roots pulled her back from the glitz and glamour of Hollywood to England. 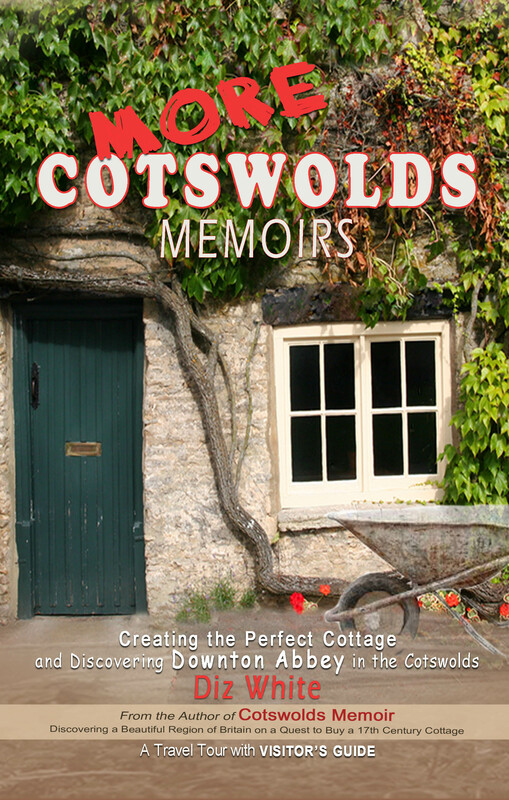 More Cotswolds Memoirs doubles as a travel-tour with pub walks, hog roasts and historic sites, and is also a laugh-out-loud, good life, foodie, meet the eccentric locals, cliff-hanging read. The author scrambles between Hollywood and the Cotswolds, often hilariously descending the ladder of success as she takes every acting job offered in order to finance her dream and overcome all obstacles to achieve her goal – Cotswold bliss in her newly-renovated cottage. MONDAY 28th MARCH at 7.30 p.m.
TUESDAY 29th MARCH at 7.00p.m. Wednesday 30th MARCH at 7.00p.m. Available from Amazon and Fine Book Stores in April 2016. This sequel finds the author on another fun-filled roller-coaster ride as she discovers Downton Abbey’s film locations in the Cotswolds, explores their history and meets the cast during her bid to turn her newly-purchased home into the perfect cottage. More Cotswolds Memoirs doubles as a travel-tour with pub walks, hog roasts and historic sites, and is also a laugh-out-loud, good life, foodie, meet the eccentric locals, cliff-hanging read.The author scrambles between Hollywood and the Cotswolds, often hilariously descending the ladder of success as she takes every acting job offered in order to finance her dream and overcome all obstacles to achieve her goal – Cotswold bliss in her newly-renovated cottage. More Cotswolds Memoirs published by Larrabee Libraries. A division of Larrabee Industries, Inc.
A portion of the proceeds of every copy of COTSWOLDS MEMOIR: is donated to Cotswold conservation institutions. This entry was posted in Uncategorized and tagged Cotswolds, cottage, Downton Abbey. Bookmark the permalink.